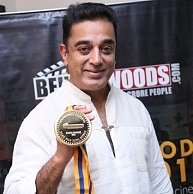 Kamal Haasan who also directed, produced, wrote lyrics and rendered his voice for couple of songs in Vishwaroopam, in addition to playing the lead was bestowed with the Behindwoods Gold Medal for Legendary Performance in Vishwaroopam. In his acceptance speech, Ulaganayagan said, “I had showered Balachander many a times with awards verbally, and this makes it more special and a proud moment to receive an award on the same dais as him". Kamal Haasan Starrer Drishyam's Cast ? Ulaganayagan Kamal Haasan And Ilayathalapathy Vijay After 9 Years ? 5 Highlights Of Kamal Haasan's Uttama Villain Teaser! Poster For DSP's Upcoming Concerts Has Been Launched By Ulaganayagan Kamal Haasan. People looking for online information on Behindwoods Gold Medals 2013, BWGoldMedals, Kamal Haasan will find this news story useful.